Karl Kirschenman is the president for K2 Consulting Group and holds a Bachelor of Science degree in communication, with over 10 years of experience in the collision industry. He has previously worked as the collision program manager for ALLDATA and the director of technology for I-CAR. Welcome to February, the month of love. Valentine’s Day is this month and your obstacles are many, right out of the gate. Order the flowers, buy the chocolates and try to find that perfect gift that says, “Thanks for putting up with me for another year.” Just try and do all of this without breaking the bank. And don’t forget to make those dinner reservations right now. Otherwise, you and your spouse will be waiting in line for two hours at Karl’s Chicken Shack to enjoy their gourmet chicken and waffles (how “romantic”), or begging the staff at Chez Jason’s for their only remaining reservation time at 11 p.m.
February has even more love to offer as our shops are busy with winter-related work. We love that – and we also love that spring is coming in a few months. And we have a great squeeze type resistance spot welder (STRSW). Oh, we love that last one very much. Let’s talk about that STRSW for a second. What’s not to love about that piece of equipment? You pull the trigger and it makes a weld that looks like the OEM did it right in their factory. Depending on your STRSW model, most everything may be pre-programmed and it works just great. 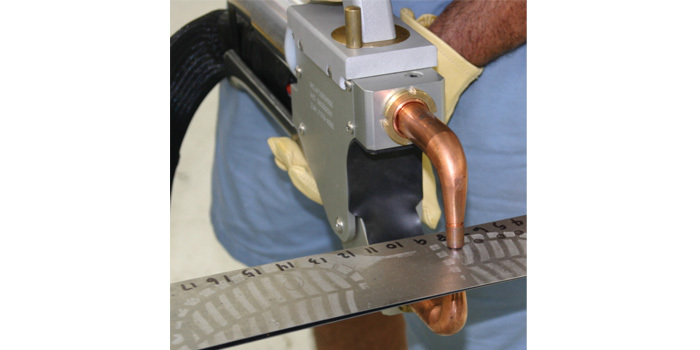 It also can reduce the time required to dress the welds when compared to doing a Metal Inert Gas (MIG) weld. This month, we’re going to talk about how to get the most out of your spot welder, you’ll hear a lot of industry folks tell you that it’s pretty hard to do a bad weld with these wonders of metal welding technology. It’s true that most of the machines will shut down before they allow a bad weld, but that does not prevent you from creating welds that are weak and/or will immediately begin to corrode. If you’re going to spend a ton of money on a STRSW (and you have or you will), there are items you need to consider. First and foremost, you need to have electrical service capable of supporting your new equipment. STRSWs draw a ton of power in order to make those perfect welds. Just because your shop’s electrical service is compliant with the local electrical codes doesn’t mean that power supply is capable of handling the amount of voltage necessary to feed the welder properly. I recommend that you engage a trusted electrician during the purchasing process to make sure you have the proper service to the building. Check your breaker size to determine if it holds enough capacity. Most STRSWs require three-phase/220-volt service. If your electrical service provider is giving you 210-volt service and you’re running a 50-foot extension cord to your welder, chances are your welder is going to shut down because you’re not providing it enough power to operate properly. Rule of thumb: if you’re going to run electrical wire or upgrade your electrical service, install more capacity than you think you’ll ever need. Larger wire costs a little more, but the installation labor is the same. Plan for the future now, instead of upgrading your service twice. It will be more economical to invest in your power supply now than when we begin to see more aluminum and the next class of higher-strength steels flood into your shops. Look for OEM approvals for the spot welder manufacturer and model you’re considering. Examine how the unit rolls and moves throughout the work area. Does it move easily, or do you have to wrestle with it to get it into place? If your techs have trouble moving it around, they’re less likely to use it. Make sure that the welder head is comfortable and easy to use. The welder heads can be very heavy. You will want to find a good system with a balancer that offsets the weight. Ask about the electrodes. You’ll want to know the amount and types of electrodes that the equipment manufacturer provides. Determine if they’re correct for the majority of the work that flows through your facility. Make sure that you know upfront if they’re liquid cooled or not. Ask what’s included in the standard equipment configuration and what items are available as optional accessories. Research the electrical requirements necessary to provide adequate power to the equipment (see “Shop Environment”). Determine if the welder interface is simple and easy to understand. Interfaces vary between welders; make sure it’s not complicated and you can easily understand the welder’s settings. Get deep into the menu system. Make sure you have the ability to configure the equipment so that you can fine-tune the welds as necessary. Simple is nice; simple and powerful is optimal. Know what settings are automatic and which ones require human input. If you leave everything in “default” settings all of the time, you’re just asking for bad welds. STRSWs are being manufactured so they’re modular and upgradeable. Find out just how modular the welder is from the manufacturer and if they’re supporting future upgrades for your exact model. It’s great that it’s upgradable, but if they don’t make the upgrades…you get the idea. Make sure the welder has a USB or memory card slot for storing settings and reporting weld data. Before your shop begins any structural work on a vehicle, you must review the OEM information detailing the proper structural repair procedures and vehicle construction materials. There are several resources available for this information, including the vehicle manufacturers. At a minimum, you should determine if you can section a part or, if it’s recommended that the entire part be replaced, what types of construction materials the vehicle contains and the welding guidelines for the repair. Panel preparation is another key factor in successfully joining metal panels with your STRSW. Make sure to prep the panels according to the vehicle manufacturer’s recommendations. Check the vehicle manufacturer’s recommendations on whether you’re required to use weld-thru primer. Another example would be weld bonding procedures. In many situations, the vehicle manufacturer will list an approved adhesive to use for weld bonding. If this is true, then you’ll need to follow the product manufacturer’s recommendations for surface preparation, bead height, bead width, clamping and curing following welding. Before making any welds, make sure to uncoil the cable and remove it from the back of the machine. This will prevent your power supply cable from becoming a huge electromagnet. A coiled power supply cable plus a high-voltage electrical current equals magnetism and the need for a new cell phone or new vehicle electronics. While we’re looking at the welder, let’s conduct a thorough review of the electrodes. Depending on the equipment manufacturer, electrode tips will typically come in two types: shafts or caps. Electrode shafts can be sharpened multiple times to ensure the proper tip diameter is maintained. Electrode caps need to be replaced to restore the proper tip diameter. Make sure your shafts and caps are aligned properly. Electrode misalignment may cause weak and substandard welds. With either shafts or caps, you need to keep them clean to avoid introducing contaminants into the welds. Cleaning the tips more often will help ensure you’re creating acceptable welds. Follow the welder manufacturer’s recommendations concerning frequency of cleaning, replacement of your shafts and caps, and any required maintenance cycles for your equipment. Finally, always conduct destructive tests before each panel replacement. If your equipment setup is not correct, it will become apparent quickly during a destructive weld test. Cut coupons from the damaged or unused portion of the replacement parts and use them as your test pieces. Align the flanges so they resemble the flanges on the vehicle. Make sure the weld nugget size and the tearout hole match the OEM requirements (see “Getting Ready to Repair”). When your business invests in a STRSW, you’re really investing in the ability to consistently produce a safe repair for your customer. Your goals should always surround returning a vehicle back to your customer that’s safe and repaired according to the OEM repair requirements. Leveraging your investment in quality welding along with collision repair facility best practices such as 100 percent teardown, repair blueprinting and parts mirror matching go a long way in efficiently repairing every vehicle. Now, that’s something you just have to love too.